RALEIGH -- During an election year, it is difficult to tune out the political static that clogs news outlets. In the age of social media, it is impossible. This presidential race seems to have a certain "shock value" that campaigns lacked in elections past. The voter-base is now accustomed to the candidates' exposure on main stream media; one candidate in particular has dominated the news cycle for months now. Donald Trump's campaign is unavoidable. Whether you support his candidacy or not, his political persona is a force to be reckoned with. But how are we, as Americans and as adults, expected to explain the reality-TV star turned presidential hopeful to our most impressionable citizens? One Raleigh mom was caught off-guard when her 5-year-old daughter began vehemently opposing Trump. In light of the current political climate, former reporter Amy Davis took to the blogosphere in order to explain her version of "preschool politics." "One Trump opposer in my life is the loudest," Davis wrote in her blog, Somebody's Parents. "I've watched her disgust for him grow with each debate clip or Today Show interview she happens to see. After cartoons, of course." She wrote her 5-year-old daughter, Charlotte, is "staunchly" opposed to Trump. She explained that she and her husband had not spoken about Trump to their daughter before last fall, when Charlotte's feelings about the presidential contender bubbled to the surface. Davis said Charlotte was playing in the living room one evening when she took notice of Trump on CNN. He was speaking live at a campaign rally in Iowa. Charlotte asked who he was, and what he was doing, and Davis informed her. "She scowled and said, 'Mama, he is rude!'" Davis wrote. Davis spoke to ABC11 about her blog post, and what inspired her to write it. "The biggest thing was seeing the negativity that my pre-schooler displayed. That spoke volumes about the political discourse in our country right now," Davis shared. "For her to pick up on that, from walking by the TV, just caught me off-guard." While Davis' husband was more candid with his explanation of Trump, Davis chose to take a more impartial approach. "They say 5-year-olds ask 900 million questions a day or something like that. I'm convinced 890 million of those are to request a snack. On this particular day, she saved 10 million questions for an impromptu preschool civics lesson," Davis wrote. Davis told ABC11 she attempted to explain to her curious daughter why she would vote for the candidates she likes, rather than bashing Trump. "I just really wanted to encourage her to, instead of dogging a candidate, to pick one she likes." It seemed as though Charlotte was bored of the Trump talks. However, months later, her disdain persisted. 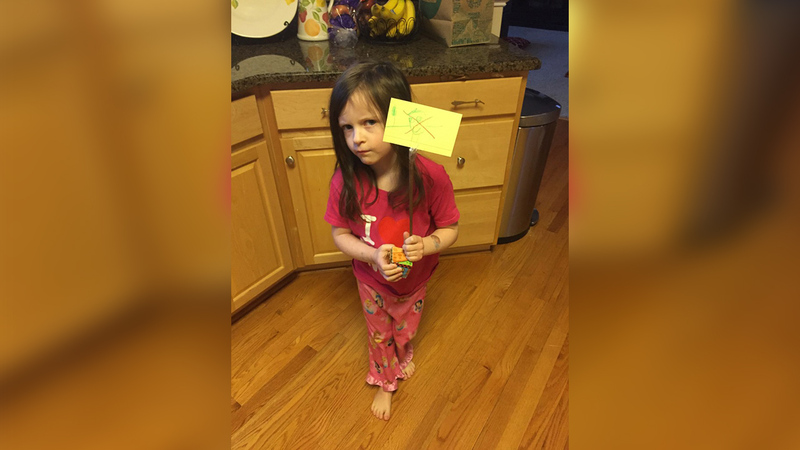 Davis said Charlotte made her own version of a protest sign with an index card, a chopstick, and Disney "Frozen" stickers. "Her chants started to sound less spirited and more nasty. This hurt my heart a little. She doesn't watch that much news, right? Could the nasty political, discourse in our nation be influencing her young mind?" She stopped Charlotte's chant, she wrote, and explained to her that just because they aren't voting for a certain candidate, doesn't mean we have to talk nasty about them. "I think that when I heard her instantly say 'Boo Donald Trump!' and stick her tongue out, that immediately caught me off guard. I think she picked up on that from the pundits and the protesters that she saw on television...and I think somewhat from my husband, she noticed him scoffing." Davis told ABC11 she thinks Trump's continued exposure in the media influenced Charlotte's palpable distaste. "Even for little kids, it's unavoidable. We have on CNN, and it's on every day. His sound bites pop up every day. Even our littlest citizens, they pick up on everything." Charlotte even held a mock-interview with Donald Trump (played by a stuffed Cookie Monster), where she had the opportunity to drill "Trump" with the tough questions. I asked Davis if she had any tactical advice for other parents who may want to explain the current political climate to their children. "I don't know if I'm the right person to give advice. I think it's important to have your child focus on the candidates they do like, instead of protesting the candidates." Davis said she has had a positive response since posting her experience on her blog. "I'd like to think that, after I wrote it, I had a positive response from other adults who liked the idea that I was trying to encourage positivity instead of negativity." Davis wrote on her blog that she's trying her hardest to raise a daughter who will understand that being clever and kind are more important than being pretty. "It makes me feel very proud of her, that she already shows interest in the world around her outside of cartoons and toys, and that she understands that the world is a big place and she can make a difference," Davis shared. Charlotte will begin kindergarten in the fall. As for future plans, Davis has a vague idea of what her 5-year-old's career trajectory might look like. "I can just make plans to pay for a Poli Sci degree and watch her run a fierce smear campaign against the Republican nominee when she graduates in 2032," Davis joked. To read Amy Davis' Somebody's Parents blog, click here.